A timeline is something that seems to present itself at every subject in every grade level. You are always sequencing something. 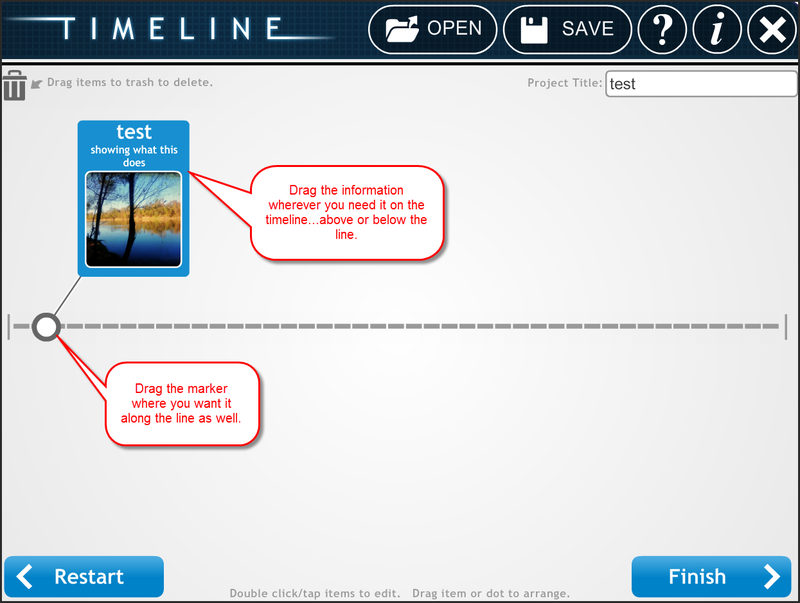 This week I ran across a great site for creating timelines from ReadWriteThink.org. I have used their stuff in the past and this one lives up to the bill: easy to use and a nice product at the end. Upon accessing the program, you will be prompted to enter your name and a title for your timeline. A new window will open up. Here is where you can start adding the information to your timeline. Click on the dotted line to start adding your events. A wizard will open in a new window. Fill in what is pertinent to your project. You can add a label or title, short description, and full description. You can also add an image from your computer. 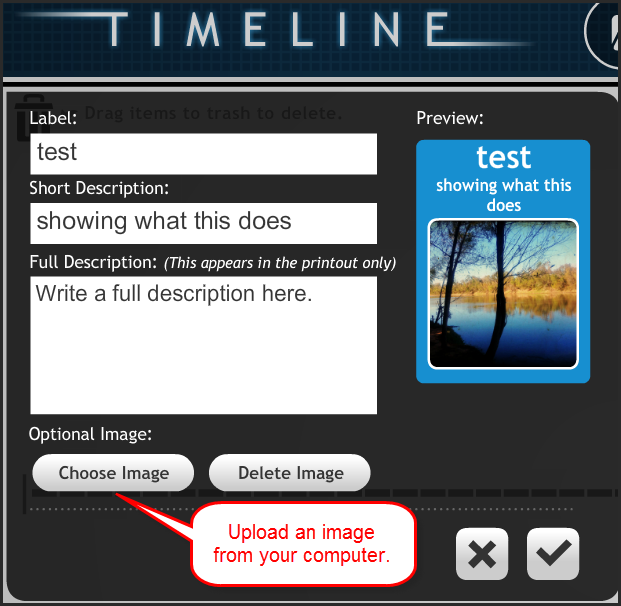 The label and short description will appear with an image (optional) on the timeline itself. If you choose to add a full description, that is listed on an adjoining page upon completion. It does not appear on the visual timeline. Once you add an event to the timeline you are able to drag it to the correct location. If your events need to change their sequence you are still able to do so later. You can drag the cards above or below the line and to any location. The marker on the line can also be dragged to a new location if need be. You have the option to save your work as you go along and return to it. A file is saved to your computer. Upon returning to the site you can choose to open an existing file and continue working. Note that the program itself will NOT save your work. You must save it to your computer if you do not finish. When you are completely done, choose to finish your work. You will have options to save, print, or email. The final format for the project will be a PDF. 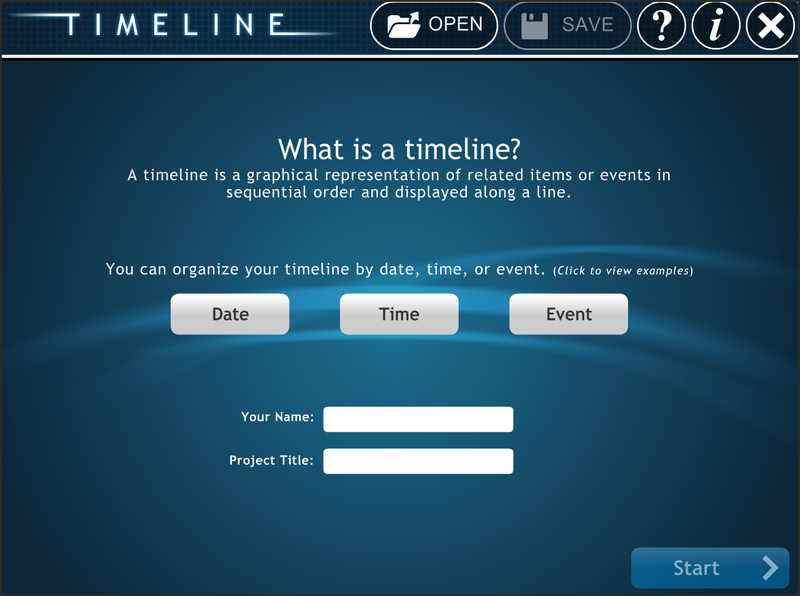 Click here to view an example timeline. Do you have iPads in your classroom? There is a free app that follows the same format as the program online. You can access your camera roll to add images and your final project is saved as an image to the camera roll if you choose. Click here to visit the app in the app store.